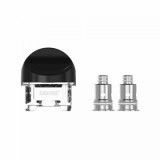 The Orbit Pod Cartridge is designed for Sense Orbit Pod Kit, coming with 3ml e-juice capacity and two different coils: 0.6ohm mesh coil for DL vaping and 1.1ohm Kanthal coil for MTL vaping. The Sense Orbit Pod is designed especially for the Sense Orbit Pod Starter Kit. The Sense Orbit Pod Cartridge comes with 2.5ml e-liquid capacity. Featuring two different coils: 0.6ohm mesh coil for DL vaping and 1.1ohm Kanthal coil for MTL vaping. 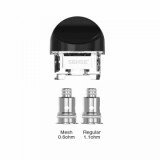 Come and get one as a spare part to enjoy amazing vaping. • Sense Orbit TF Pod Kit is also available in BuyBest.